A plate bottomed, blue included Arkansas crystal cluster -so finely included with shale that some crystals actually are cadet blue, some have grown clear or veiled white - is large cabinet sized, 6x 6-1/2x 3-3/4" high on base. 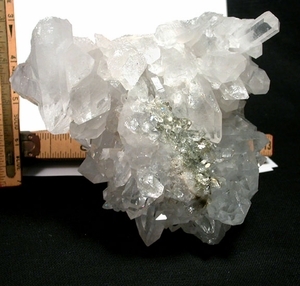 The largest crystals are 1x 2-1/2" tall. We note several sets of twin points, rainbows, plenty of regrowth, an interesting contact crater, and four chips [1/8" largest]. Record keepers. Ebullient energy and great display!